Kay Kenyon recently got in touch with me to inquire if I'd be interested in a guest review for the sequel to Dan Koboldt's The Rogue Retrieval, this one titled The Island Deception. Of course, I was happy to oblige. 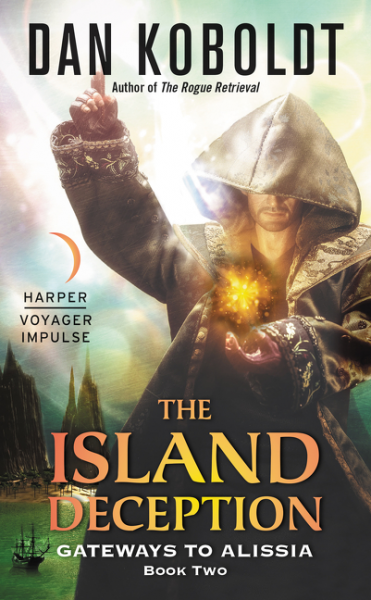 Continuing the exciting adventures from The Rogue Retrieval, The Island Deception blends fun and mystery into a brilliant new portal fantasy from Dan Koboldt. Oh, the hopes and hurdles in reading second books in a series! On the plus side, you've met most of the characters and are looking forward to spending more time with them. You've got the milieu and want a return engagement. You can relax and enjoy the ride. But in the back of your mind sits a cynical, snarky, read-spoiling hunch that the second book will falter because the author will save too much stuff for book three, leaving book two in a holding pattern. I'm pleased to report that is not the case with Dan Koboldt's The Island Deception, book two of the Gateways to Alissia novels. In this wry, caper-style series, the story arc continues: Quinn Bradley, an ambitious, cheerfully self-centered Las Vegas magician joins a corporate team to pursue their proprietary goals in Alissia, a magic-wielding realm accessed through a secret portal. The mission this time is to stop "by any means necessary" Richard Holt, CASE Global's former key employee. Holt went native in Alissia and may soon control it from the inside, preventing CASE Global from exploiting the world they discovered. It's not yet clear what the company wants in Alissia. Is CASE the usual corporate villain or will they attempt to protect backward Alissia from ruinous attention? I suspect it's the former, but I enjoy not being sure. And therein lies one of the pleasures of this magical adventure series. With book two, the story deepens the mysteries, ambiguities, and reversals, leaving us suspicious of most everyone. As the book's title suggests, everyone appears to be lying, sometimes even to themselves. Koboldt has a deft touch with unanswered questions, a tricky skill that in a lesser author's hands can be so annoying. Is Richard Holt really the power-hungry rogue portrayed by CASE Global? Is CASE merely a soul-sucking corporation on a ruinous mission to subdue the magic land or do they have a redeeming plan? What are the hidden agendas of CASE team members Kiara, Logan, and Veena? By now we know they have some, but no one is showing their cards. And just how far can we trust Bradley Quinn as a narrator? He was always self-serving, but now with more power-tricks at his disposal, will our hero decide he's just in it for himself? My impatience with the world building, which began with the first book, The Rogue Retrieval, remains: What is the nature of the portal? Where else does it lead to? If nowhere else, why? What do CASE and Quinn make of this surprising doorway and why it would lead to an alternate world populated by humans? I'm ready to believe that all will be revealed in the final book of the trilogy, but it's hard to believe that no one so far wonders about these things. Despite the gloss over the portal and the alternate world, I'm still engaged with this story for the strongest possible reason: the major character. Bradley Quinn provides a beguiling, witty, and ironic point of view that lifts every scene he's in. Quinn's fascination with magic carries him merrily through the plot, dodging other people's agendas while falling in love, wriggling out of every attempt to control him, and blissfully pursuing the ultimate magic show. His droll internal asides (I guess we bonded over that whole fleeing-reptilian-predators thing) and his shoot-from-the-hip repartee make for a lively, even compulsive, read. More Bradley Quinn, please. The next rabbit-out-of-the-hat from Koboldt materializes in February of next year, tentatively titled The World Awakening. Kay Kenyon is the author of thirteen science fiction and fantasy novels. Her latest work is At the Table of Wolves, an historical fantasy of dark powers, Nazi conspiracies, and espionage set in 1936 England (Saga Press, July 2017.) The Dark Talents novels will continue in spring 2018 with Serpent in the Heather.